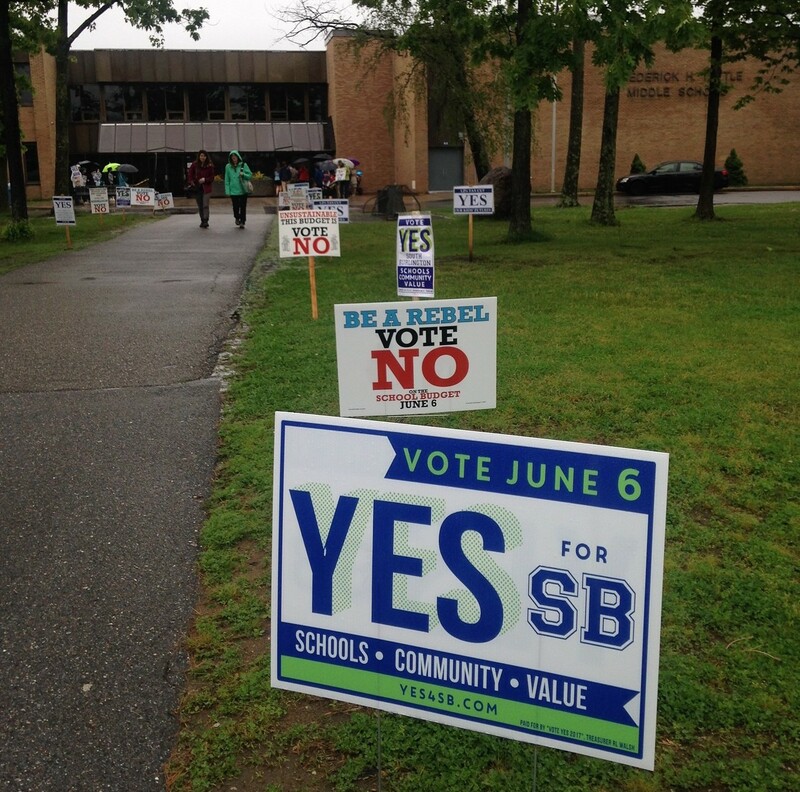 South Burlington voters approved their school budget by a wide margin Tuesday, but not before another racially tinged incident made waves in the community. About 60 percent of residents casting ballots voted to pass the spending plan — the district's third attempt at a budget in three months. The approval — by a 3,146 to 2,067 margin — ended an acrimonious budget season in a community where budgets have almost always passed on the first try. That is, until controversy over the "Rebels" nickname and school spending blew up this year. The budget passed in three of four voting districts. Only voters in the Chamberlin district said no, by a tally of 608 to 572. The big vote, though, was marred by the discovery earlier in the day of racist graffiti spray-painted on the high school's primary athletic field. The incident forced the boys lacrosse team to play its home semifinal playoff game against Burr and Burton Academy at Burlington High School's field. During a press conference Tuesday afternoon, South Burlington High School Principal Patrick Burke urged anyone with information about the vandalism to contact the school or South Burlington police. He and Superintendent of Schools David Young wouldn't say what was spray-painted, or whether it was directly connected to the "Rebels" mascot debate. They also wouldn't answer whether the surveillance videos were running when the vandalism took place. School employees discovered the graffiti around 2 p.m. Tuesday. Police are investigating the incident. “We're not going to go into the specifics of the situation. It is an active investigation,” Young said. After a spring of school lockdowns, death threats and heated controversy over the racial connotations of the "Rebels" nickname, the incident Tuesday was yet another challenge for the school administration. Young seemed deflated, and described himself as "really upset about it." A truck in the parking lot near voting at Tuttle Middle School. After the press conference, two men in rain ponchos could be seen standing in the center of the Munson athletic field where the vandalism took place. A tarp had been stretched over a section of the artificial turf, apparently to conceal the graffiti. Meanwhile, at Frederick H. Tuttle Middle School, across the parking lot from the high school, signs for and against the spending plan lined the walkway that residents crossed to enter the building and vote. 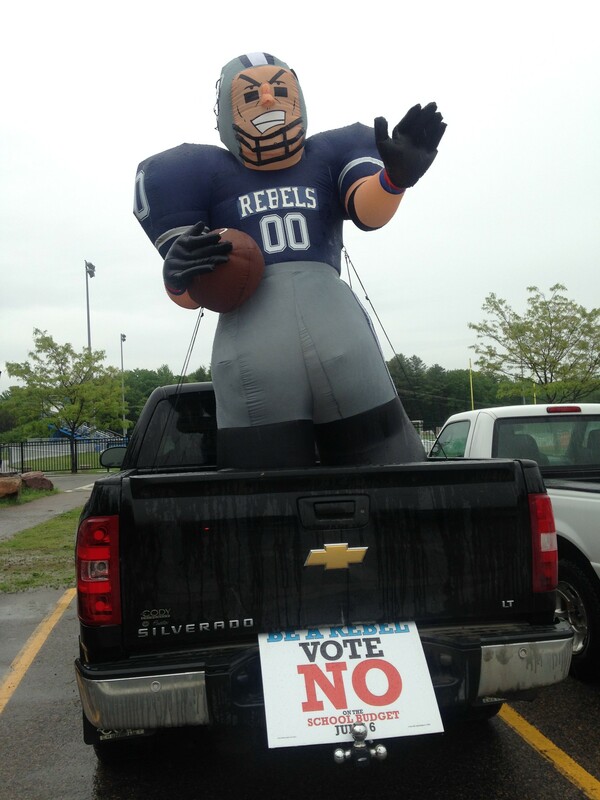 In the back of a pickup truck, a blow-up football player in a Rebels uniform served as part of a display urging voters to turn down the budget. But critics of the name change, who had encouraged residents to once again defeat the budget, failed this time. Signs for the winning side read: "Vote Yes for SB. Schools. Community. Value." *Correction, June 7, 2017: A previous version of this story had the incorrect property tax change. The budget will result in a decrease.